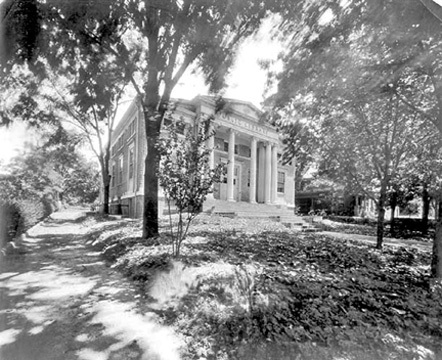 Durham’s second library, the Classical Revival structure pictured here, was completed in 1921 after library operations outgrew the original location at Five Points. The construction was made possible by the receipt of a Carnegie Foundation grant, which supplied $32,000 of the $59,000 needed to construct the new library on East Main Street. This highly sought after grant was awarded only after much negotiation and delay because of World War I. The building housed 8,000 volumes, more than twice the original library’s capacity. By the 1960s it too was bursting at the seams. The new library on Roxboro Street opened in 1980, and the Neoclassical Carnegie Library sat abandoned until it was renovated privately in 1984. Since its founding, the Durham County Public Library System has grown to include eight regional libraries and branches, attracting over two million annual visitors.